STYLISH. PRACTICAL. ECO FRIENDLY HOUSEWARE. We love a clean home. And even more, we love a clean earth. We are a small family business located in sunny Southern Southern California. Our products are made from material that is renewable and good for the environment. Feel good knowing that each product you purchase helps reduce your environmental footprint. Join our mailing list and take advantage of special sales and new product announcements. I have been searching for the perfect bread box for some time now. It needed to be small enough to keep on my rather limited counter space and large enough to be functional. The moment I spotted this Clean Dezign bread box with cutting board lid I knew it was what I wanted. I like the cutting board on top as I honestly needed a new one and having it build in is a great idea along with being eco-friendly. Great quality with versatility is what I think of with this bread box. Impressive quality… better than using plastic… and they look great and are functional… You can’t go wrong with these. 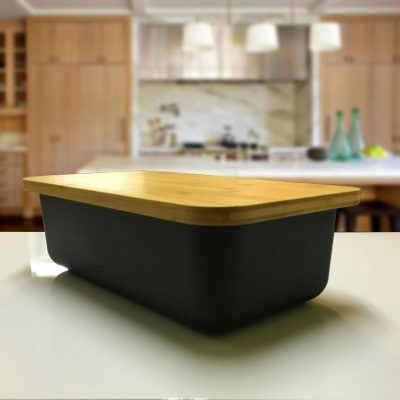 #cleandezign what a gorgeous bamboo fiber breadbox! It’s perfect for picnics and for storing and cutting bread!! I absolutely love it!